The study was initiated to investigate the effect of Biofield Treatment on DMEM medium for bone health in MG-63 cells. The test item, DMEM medium was divided into two parts. The test item received Biofield Treatment by a renowned Biofield Energy Healer, Dahryn Trivedi and was labeled as the Biofield Treated DMEM, while the other part did not receive any treatment and denoted as untreated DMEM group. MTT assay showed that cell viability of the test item was more than 77%, which indicate a safe and non-toxic profile of the test items in MG-63 cells. The level of ALP was significantly (p≤0.001) increased by 42.86% in Biofield Treated DMEM compared with untreated DMEM. Overall, data envisaged that the Biofield Treated DMEM would play an important role for the growth of MG-63 cells along with an improved bone health parameter i.e. ALP level, which plays vital role in the promotion and maintenance of strong and healthy bones. Further, it could be used in numerous bone-related disorders viz. rickets, osteoporosis, deformed bones, Paget’s disease of bone, bone loss and fractures, osteomalacia, bone and/or joint pain, osteoma, hormonal imbalance, stress, and aging. CAM: Complementary and Alternative Medicine, NCCAM: National Center for Complementary and Alternative Medicine; MG-63: Human Bone Osteosarcoma Cells, ALP: Alkaline phosphatase, DMEM: Dulbecco's Modified Eagle's Medium, FBS: Fetal Bovine Serum. Alkaline phosphatases (ALP) are the plasma membrane-bound glycoproteins, which are widely distributed in nature. Bone ALP is a useful biochemical marker of bone formation and is important for the bone mineralization also. Besides, ALP many other bone health biomarkers are available such as collagen, bone mineralization, calcium level, etc. However, ALP is one of the important factors in bone health, which is widely used in bone health cell line studies. ALP is a phenotypic marker for maturation of osteoblasts and it also increases the local concentration of inorganic phosphate that is required for bone mineralization (Iba et al. 2014). Bone is a remarkable tissue with a strong functional structure to withstand intense physical activity that allows efficient movement. The skeleton system is one of the major physiological metabolic system (Lorincz et al. 2009). Skeleton system has dynamic tissue, which protects damage in various vital organs with mechanical forces. It acts as levers that transmit the mechanical force from one area of the body to another through muscle-driven motion. Metabolically, the skeleton system contained abundant blood cell types and is considered as the major calcium reservoir of the body. Bone health major nutrients such as calcium and vitamin D3 play a vital role in preserving a healthy mineralized skeleton (Holick MF, 1996). Other rich sources are milk and dairy products, green and yellow vegetables, soybeans, and fish are also good sources of calcium for bone health. Besides, foods for specified health use (FOSHO) comprising calcium or other ingredients to improve calcium absorption can be utilized for increasing calcium intake. Calcium and vitamin D3 have significant roles as anti-inflammatory, anti-arthritic, anti-osteoporosis, anti-stress, anti-aging, anti-apoptotic, wound healing, anti-cancer, anti-psychotic, and anti-fibrotic roles (Flynn A, 2003; Cashman KD, 2007; Lips P, 2001). MG-63 cells derived from juxtacortical osteosarcoma. The response of MG-63 cells to 1,25-dihydroxyvitamin D3 (1,25(OH)2D3) administration has been studied to be similar to normal human osteoblast cells (Czekanska et al. 2012). Hence, MG-63 cell line is widely used for studying the potential of any test compounds to improve the bone health (Luo and Liao, 2003). Authors evaluated the in vitro effect of the Biofield Energy Treated DMEM media as a test item on bone health using MG-63 cellsfor ALP biomarker. Within the growing demand for CAM therapies, Biofield or energy medicine is emerging with significant benefits in various scientific fields. CAM therapies has extensively used in the community which include external qigong, Johrei, Reiki, therapeutic touch, yoga, Qi Gong, pranic healing, polarity therapy, Ayurvedic medicine, Tai Chi, deep breathing, guided imagery, chiropractic/osteopathic manipulation, meditation, massage, homeopathy, hypnotherapy, progressive relaxation, acupressure, mindfulness, acupuncture, special diets, relaxation techniques, Rolfing structural integration, healing touch, pilates, movement therapy, traditional Chinese herbs and medicines in biological systems both in vitro and in vivo (Rubik B, 2012). Biofield contains putative bioenergy, which is channeled by a renowned practitioner from a distance. Biofield Energy Healing as a CAM showed significant results in biological studies (Barnes et al. 2008). The National Center for Complementary and Alternative Medicine (NCCAM) recommended that Biofield Therapies in the subcategory of Energy Therapies (Frass et al. 2012). The Trivedi Effect® has been reported with significant revolution in the physicochemical properties of polymers, metals, and ceramics (Trivedi and Tallapragada, 2008; a,bTrivedi, 2015), improved agricultural yield and quality (c,dTrivedi, 2015), transformed antimicrobial characteristics (e,f,gTrivedi, 2015), biotechnology (hTrivedi, 2015; Nayak and Altekar 2015), improved bioavailability (a,b,cBranton and Jana, 2017), skin health (Kinney et al. 2017; Singh et al. 2017), nutraceuticals (a,bTrivedi, 2017), cancer research (I,jTrivedi, 2015) human health and wellness (Anagnos et al. 2018; Lee et al. 2018; Stutheit et al. 2018). In this context, authors planned to evaluate the effect of Biofield Treatment on bone health in MG-63 cells using DMEM medium as a test item. Rutin hydrate was purchased from TCI, Japan. Fetal bovine serum (FBS) and Dulbecco's Modified Eagle's Medium (DMEM) were purchased from Life Technology, USA. Antibiotics solution (penicillin-streptomycin) was procured from HiMedia, India, while 3-(4, 5-dimethyl-2-thiazolyl)-2, 5-diphenyl-2H-tetrazolium) (MTT), Direct Red 80, and ethylenediaminetetraacetic acid (EDTA) were purchased from Sigma, USA. All the other chemicals used in this experiment were analytical grade procured from India. Human bone osteosarcoma cell line -MG-63 was used as test system in the present study. The MG-63 cell line was maintained in DMEM growth medium for routine culture supplemented with 10% FBS. Growth conditions were maintained as 37°C, 5%CO2 and 95% humidity and subcultured by trypsinisation followed by splitting the cell suspension into fresh flasks and supplementing with fresh cell growth medium. Three days before the start of the experiment (i.e., day -3), the growth medium of near-confluent cells was replaced with fresh phenol-free DMEM, supplemented with 10% charcoal-dextran stripped FBS (CD-FBS) and 1% penicillin-streptomycin (Trivedi et al. 2018). The experimental groups consisted of group 1 (G-I) with cells in untreated DMEM. Group 2 (G-II) consisted of positive control (rutin hydrate) at non-cytotoxic concentrations. Further, group 3 (G-III) included the test item group, which was Biofield Treated DMEM medium. The test item, DMEM medium was divided into two parts. One part each of the test item was treated with the Biofield Energy by a renowned Biofield Energy Healer, Dahryn Trivedi and coded as the Biofield Energy Treated DMEM, while the second part did not receive any sort of treatment and referred as the untreated DMEM group. This Biofield Energy Healing Treatment was provided by Dahryn Trivedi remotely for ~5 minutes. Biofield Energy Healer was remotely located in the USA, while the test item was located in the research laboratory of Dabur Research Foundation, New Delhi, India. This Biofield Energy Treatment was administered for 5 minutes through the Healer’s unique Energy Transmission process remotely to the test sample under laboratory conditions. Dahryn Trivedi in this study never visited the laboratory in person, nor had any contact with the test item (DMEM). Further, the control group was treated with a “sham” healer for comparative purposes. The “sham” healer did not have any knowledge about the Biofield Energy Treatment. After that, the Biofield Energy Treated and untreated samples were kept in similar sealed conditions for experimental study. The concentrations ≥70% cell viability was considered as safe and non-toxic. Evaluation of alkaline phosphatase (ALP) activity of the untreated and Biofield Treated DMEM in human bone osteosarcoma cell line (MG-63) was conducted as per Trivedi et al. 2018 (Stutheit et al. 2018; Trivedi et al. 2018). The level of ALP enzyme was recorded as mg/mL with respect to the untreated DMEM group. One-way analysis of variance (ANOVA) was used for multiple group comparison followed by post-hoc analysis by Dunnett’s test. Statistically significant values were set at the level of p≤0.05. Data were represented as mean ± standard deviation (SD). For the determination of non-cytotoxic concentration of the test items (untreated and Biofield Energy Treated DMEM) by MTT cell viability assay is shown in Figure 1. The results showed that the test sample was found to have significant cell viability with more than 80%. Moreover, the positive control (rutin) showed more than 77% cell viability (Figure 1). Hence, MTT data suggested that the untreated and Biofield Energy Treated DMEM were found as safe in MG-63 cells. Thus, the Biofield Energy Treated DMEM was used further to study the bone health parameter, alkaline phosphatase (ALP) activity in MG-63 cells. Figure 1: Determination of non-cytotoxic concentration using MTT cell viability assay of the positive control (rutin) and test items (DMEM) on MG-63 cell line. Alkaline Phosphatase (ALP) enzyme is the member of a family of zinc metalloprotein enzymes, which reflects the biosynthetic activity of these bone-forming cells. Bone ALP is considered as one of the sensitive and reliable indicator of bone metabolism activity. However, alteration in bone ALP results in serious bone health disorders such as post-menopausal women, bone cancers, osteoporosis, and healing fracture, Paget’s disease of bone, acromegaly, bone growth, osteogenic sarcoma, myelofibrosis, leukemia, or bone metastases, and rarely myeloma. The level of bone ALP can be overcome with help of various nutraceutical supplements or vitamin D3, calcium, etc. (Anonymous; Jesudason et al. 2002; Seeman, 2009). Biofield Energy Treated DMEM was tested with respect to the results of ALP enzyme level (mg/mL) on MG-63 cells and the data are shown in Figure 2. 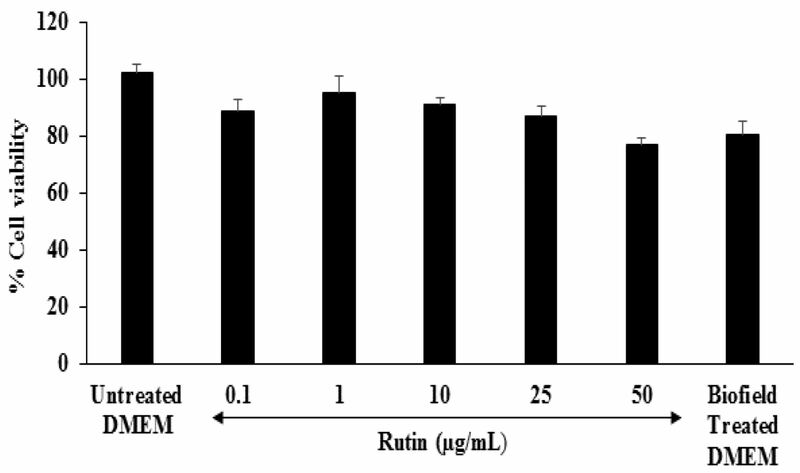 The positive control, rutin showed a significantly (p≤0.001) increased value of ALP by 214.29%, 228.57%, and 314.29% at 0.01, 0.1, and 1 µg/mL, respectively with respect to the untreated DMEM group. The Biofield Energy Treated DMEM showed a significant (p≤0.001) increase in the ALP level by 42.86% as compared with the untreated DMEM group (Figure 2). Figure 2: The potential effect of the test items (untreated and Biofield Treated DMEM) on the level of alkaline phosphatase (ALP) in MG-63 cells. ***p≤0.001 vs. untreated DMEM. Thus, overall the bone health experimental data concluded that the Biofield Energy Healing Treatment in the DMEM media showed a significant improved level of the bone ALP as compared with the untreated DMEM group, which could be the best supplementation to treat various bone and age-related diseases such as osteoporosis (Golub, 2007). Overall, the data suggested that Consciousness Energy Treated DMEM could be used to improve the level of ALP. The in vitro effect of Biofield Energy Healing based DMEM on bone health was studied and results showed significant improvement with respect to ALP activity. MTT assay for cell viability showed a significant improved cell viability with more than 77% among all the tested groups, which suggested that the test sample are found safe and nontoxic. Further, the bone health parameter, the level of ALP was increased significantly by 42.86% in Biofield Treated test item group compared with untreated DMEM. Therefore, Biofield Treated DMEM was found to have a significant impact on bone ALP level, which are very vital to combat various bone disorders. The Consciousness Energy Healing based DMEM might be a suitable alternative media for cell growth and for the management of various bone-related disorders viz. Paget’s disease of bone, osteoporosis, rickets, osteomalacia, deformed bones, bone and/or joint pain, increased frequency of fractures, osteoma, hormonal imbalance, stress, bone loss and fractures, aging, and other bone diseases that are caused by problems with the rate of bone growth, poor nutrition, or genetics. On the other hand, it might be useful to improve normal cell growth, communication, cycling, proliferation, differentiation, and neurotransmission. Further, it can also be utilized in organ transplants (for example kidney transplants, liver transplants and heart transplants), hormonal imbalance, aging, and various immune related disease conditions such as Ulcerative Colitis, Hashimoto Thyroiditis, Alzheimer’s Disease, Dermatitis, stress, Irritable Bowel Syndrome, Systemic Lupus Erythematosus, Sjogren Syndrome, Asthma, Pernicious Anemia, Multiple Sclerosis, Atherosclerosis, Myasthenia Gravis, Aplastic Anemia, Diverticulitis, Hepatitis, Graves’ Disease, Dermatomyositis, Diabetes, Parkinson’s Disease, etc. aBranton A, Jana S (2017) The influence of energy of consciousness healing treatment on low bioavailable resveratrol in male Sprague Dawley rats. International Journal of Clinical and Developmental Anatomy 3: 9-15. Anagnos D, Trivedi K, Branton A, Trivedi D, Nayak G et al. (2018) Influence of biofield treated vitamin D3 on proliferation, differentiation, and maturation of bone-related parameters in MG-63 cell-line. International Journal of Biomedical Engineering and Clinical Science 4: 6-14. Anonymous Biological evaluation of medical devices - Part 5: Tests for in vitro cytotoxicity (ISO 10993-5:2009), I.S.EN ISO, 10993-5:20093.
aTrivedi MK, Branton A, Trivedi D, Nayak G, Plikerd WD et al. (2017) A Systematic study of the biofield energy healing treatment on physicochemical, thermal, structural, and behavioral properties of magnesium gluconate. International Journal of Bioorganic Chemistry 2: 135-145.
aTrivedi MK, Nayak G, Patil S, Tallapragada RM, Latiyal O (2015) Studies of the atomic and crystalline characteristics of ceramic oxide nano powders after bio field treatment. Ind Eng Manage 4: 161.
bBranton A, Jana S (2017) The use of novel and unique biofield energy healing treatment for the improvement of poorly bioavailable compound, berberine in male Sprague Dawley rats. American Journal of Clinical and Experimental Medicine 5: 138-144.
bTrivedi MK, Branton A, Trivedi D, Nayak G, Plikerd WD et al. (2017) Chromatographic and spectroscopic characterization of the consciousness energy healing treated Withania somnifera (ashwagandha) root extract. European Journal of Biophysics 5: 38-47.
bTrivedi MK, Nayak G, Patil S, Tallapragada RM, Latiyal O et al. (2015) Effect of biofield energy treatment on physical and structural properties of calcium carbide and praseodymium oxide. International Journal of Materials Science and Applications 4: 390-395. Cashman KD (2007) Diet, nutrition, and bone health. J Nutr 137: 2507S-2512S. cBranton A, Jana S (2017) Effect of The biofield energy healing treatment on the pharmacokinetics of 25-hydroxyvitamin D3 [25(OH)D3] in rats after a single oral dose of vitamin D3. American Journal of Pharmacology and Phytotherapy 2: 11-18.
cTrivedi MK, Branton A, Trivedi D, Nayak G, Mondal SC et al. (2015) Morphological characterization, quality, yield and DNA fingerprinting of biofield energy treated alphonso mango (Mangifera indica L.). Journal of Food and Nutrition Sciences 3: 245-250.
dTrivedi MK, Branton A, Trivedi D, Nayak G, Mondal SC et al. (2015) Evaluation of biochemical marker – Glutathione and DNA fingerprinting of biofield energy treated Oryza sativa. American Journal of BioScience 3: 243-248.
eTrivedi MK, Branton A, Trivedi D, Nayak G, Charan S et al. (2015) Phenotyping and 16S rDNA analysis after biofield treatment on Citrobacter braakii: A urinary pathogen. J Clin Med Genom 3: 129. Flynn A (2003) The role of dietary calcium in bone health. Proc Nutr Soc 62: 851-858. Frass M, Strassl RP, Friehs H, Müllner M, Kundi M et al. (2012) Use and acceptance of complementary and alternative medicine among the general population and medical personnel: A systematic review. Ochsner J 12: 45-56.
fTrivedi MK, Patil S, Shettigar H, Mondal SC, Jana S (2015) Evaluation of biofield modality on viral load of Hepatitis B and C viruses. J Antivir Antiretrovir 7: 083-088.
gTrivedi MK, Patil S, Shettigar H, Mondal SC, Jana S (2015) An impact of biofield treatment: Antimycobacterial susceptibility potential using BACTEC 460/MGIT-TB System. Mycobact Dis 5: 189.
hTrivedi MK, Patil S, Shettigar H, Bairwa K, Jana S (2015) Phenotypic and biotypic characterization of Klebsiella oxytoca: An impact of biofield treatment. J Microb Biochem Technol 7: 203-206.
iTrivedi MK, Patil S, Shettigar H, Mondal SC, Jana S (2015) The potential impact of biofield treatment on human brain tumor cells: A time-lapse video microscopy. J Integr Oncol 4: 141. Jesudason D, Need AG, Horowitz M, O'Loughlin PD, Morris HA et al. (2002) Relationship between serum 25-hydroxyvitamin D and bone resorption markers in vitamin D insufficiency. Bone 31: 626-30.
jTrivedi MK, Patil S, Shettigar H, Gangwar M, Jana S (2015) In vitro evaluation of biofield treatment on cancer biomarkers involved in endometrial and prostate cancer cell lines. J Cancer Sci Ther 7: 253-257. Kinney JP, Trivedi MK, Branton A, Trivedi D, Nayak G et al. (2017) Overall skin health potential of the biofield energy healing based herbomineral formulation using various skin parameters. American Journal of Life Sciences 5: 65-74. Lee AC, Trivedi K, Branton A, Trivedi D, Nayak G et al. (2018) The potential benefits of biofield energy treated vitamin D3 on bone mineralization in human bone osteosarcoma cells (MG-63). International Journal of Nutrition and Food Sciences 7: 30-38. Lorincz C, Manske SL, Zernicke R (2009) Bone Health: Part 1, Nutrition. Sports Health 1: 253-260. Seeman E (2009) Bone modeling and remodeling. Crit Rev Eukaryot Gene Expr 19: 219-33. Singh J, Trivedi MK, Branton A, Trivedi D, Nayak G et al. (2017) Consciousness energy healing treatment based herbomineral formulation: A safe and effective approach for skin health. American Journal of Pharmacology and Phytotherapy 2: 1-10. Stutheit ME, Trivedi K, Branton A, Trivedi D, Nayak G et al. (2018) Biofield energy treated vitamin D3: Therapeutic implication on bone health using osteoblasts cells. American Journal of Life Sciences 6: 13-21. Trivedi MK, Branton A, Trivedi D, Nayak G, Mondal SC et al. (2018) Trends Journal of Sciences Research 3(3): 124-132. Trivedi MK, Tallapragada RM (2008) A transcendental to changing metal powder characteristics. Met Powder Rep 63: 22-28, 31.ound healing. N Engl J Med 1999; 341: 738–46. Singer AJ, Clark RA. Cutaneous wound healing. N Engl J Med 1999; 341: 738–46.